Brittany is a cyclist's paradise, with quiet, well-maintained country lanes, rolling hills and more challenging climbs for those that want them. 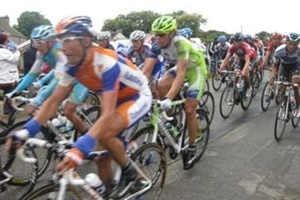 Visitors can even tackle the famous Tour de France stage 6 finish at nearby Mur de Bretagne. New for 2018, we are welcoming groups of around 10 cyclists who want to experience some of the best road cycling in Europe. Prices start from £575 and include 5 days' self-guided cycling on tried and tested routes, 4 nights' accommodation, breakfast and evening meals in our beautiful barn, energising snacks, picnic lunches, and luggage transportation from St Malo. Please email us for more details. We've picked the best walks in our corner of Brittany, from the magical ancient Huelgoat forest to dramatic clifftop walks along the Morbihan coastline. Our walks will also take you to stunning lakes, secluded beaches, pretty Gulf islands, canals, pilgrim paths, Medieval towns and villages and ancient chapels. Walks can be designed according to ability, from easy half day walks to more challenging full day excursions. Groups of 14-20 are welcome. Walking holidays are available in September/October and March/April. Prices are from £575 per person. See below for details of what's included. Walks have been designed to take in a variety of landscapes and can be adjusted according to your group's preferences and fitness levels. Most of the walks follow circular routes, so you won't tread the same path twice. Some of the walks are along designated walking trails, known as 'randonnées', while others we have discovered ourselves. This quiet corner of Brittany is worth exploring at any time of the year, but our walking holidays take place in the spring and autumn, so you'll be seeing the region at its most peaceful and beautiful. To find out more about the daily walks, see the suggested itineraries below. Of course, a walking or cycling holiday in France should be as much about the food as about the walks or cycle rides. Your day will start with a continental breakfast, served in your gite or in the barn, with cereal, yoghurts, fruit juice and freshly-made baguettes or croissants from the village bakery. You'll stop en route for a picnic of baguettes with delicious French cheeses and pates. Three-course evening meals, with wine, will be served in our chapel barn in front of the wood fire burner. Home-cooked dishes include warm goats cheese with honey salad or seasonal vegetable tart to start, followed by a main course of coq au vin with thyme and garlic roast potatoes and curly kale or tartiflette with reblochon cheese and a fresh green salad, followed by mousse au chocolat or orange and almond upside down cake. Dishes will make the most of the seasonal vegetables from our own vegetable garden. Vegetarians can be catered for too. Walking holidays include seven nights' gite accommodation, daily guided walks, daily continental breakfast, four picnic lunches, one lunch at a local restaurant, and five three-course evening meals, with wine, at Guebernez, served in our old chapel barn. On two evenings you are invited to sample some of the nearby restaurants. The holiday does not include travel to and from Guebernez or transport during the week, therefore we recommend that guests come by ferry in their own cars. Please email us for prices and dates. All walks are within an hour's drive of Guebernez and most are within 20 minutes. We can give advice on the best crossings and can get you a 20% discount with Brittany Ferries. Start at L’Abbaye de Bon Repos, a medieval abbey, and follow the edge of Brittany’s largest lake, Lac de Guerledan, through the ancient Quénécan forest, known as ‘Swiss Brittany’, to Anse de Sordan, a small marina and beach. Stop for a picnic lunch with stunning views. After lunch walk back through the forest, past beautiful stone cottages, to Bon Repos. Follow the Circuit des Chapelles, including the stunning setting of Chapelle Sainte-Barbe, perched high on a hill and with fabulous countryside views. 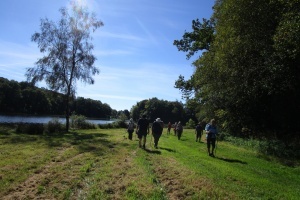 This walk will take you alongside rivers, past natural springs, and through pretty countryside, ending with a 3-course lunch in a friendly family-run restaurant in the picturesque medieval market town of Le Faouet. Optional visit in the afternoon to a local bee or history museum, or to a nearby deer park where you can take a tour in a golf buggy or 4x4 truck. Drive down quiet roads to the Morbihan coastline to the beach at Le Pouldu. From here, you’ll walk along the undulating coastal path, past quiet coves, beaches and seaside cottages to the picture-perfect port of Doelan for a picnic lunch by the estuary. Then, walk back along the coastal path to Le Pouldu, admiring the views from the other direction. Start at Guebernez and walk through the tiny hamlet of Bot Coet, then through the woods to the pretty Chapelle de Crenenan, then continue the woodland trail to the medieval town of Guemene sur Scorff for lunch at one of Brittany’s oldest restaurants, Les Trois Marchands. After lunch take a walking tour of this quaint market town and head back to Guebernez (by foot or by car).